JIPMER 2016 Vacancies For Various Posts Nurse Technician Physical Instructor :- A medical college in Puducherry, Jawahar Lal Institute of Post Graduate Medical Education & Research (JIPMER) has unveiled the vacancies for recruitment of eligible candidates for posts like staff nurse, X-ray technician and physical instructor. Through this recruitment approaches, JIPMER frame to pack up with 92 opening vacancies. Applicants will be shortlisted based on merit list as to their performance in a written examination directed by the concerned authority. The last date to apply is August 16, 2016. Applicants who are applying for the post of staff nurse should have degree or diploma in General Nursing and Midwifery, or similar from a recognized University or Institution. They should be enrolled as Nurse and Midwife under Indian Nursing council Act 1947 (INCA) or any State Nursing Council. As to regard for the X-ray technician (radio-diagnosis) posts, applicants should have a degree of 10 +2 or similar with science subjects from an affiliated board and B.Sc in Medical Radiation Technology (3 years course) or similar from an affiliated University or Institute certified by AERB. The applicants should also have at least two years of experience in running and operating radiodiagnosis or radiotherapy apparatus in an authorized centre. Diploma-holders in Radiology (a two-year course) or similar from an approved Institution certified by AERB can also apply provided they have three years experience in operating radiodiagnosis or radiotherapy apparatus in an authorized centre. Candidates applying for X-ray technician (radio-therapy) must be completed 10 +2 or similar with science subjects from an affiliated board and pursued B.Sc in Radiotherapy Technology or Medical Technology (Radiotherapy), or Medical Radiation Technology (three years course) from an AERB certified University or Institute with two-year experience in Radiotherapy. Also having 2 years experience in the same. For physical instructor post, having a degree of 10+2 or similar from an affiliated board and also have a degree in Physical Education (B.P.Ed.). Two years experience as a physical instructor in a reputed Institute is preferred. Aspirants will be picked on the basis of Written test by the concerned authority. 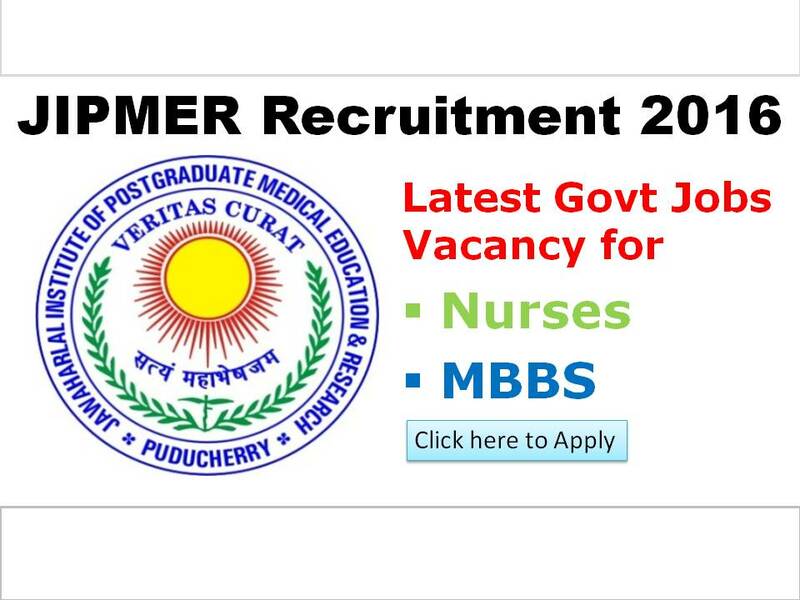 Interested applicants can seek to JIPMER Puducherry only through the offline form. The application fees for General and OBC category is Rs. 500 and for SC / ST category is Rs. 250. Persons with Disabilities (PwD) candidates need not pay any fee. The application fee is non-refundable and has to be paid by demand draft (DD) in favor of The Director, JIPMER payable at State Bank of India, JIPMER Branch, Puducherry. • Central Government servant seeking age relaxation would be required to produce a Certificate from his/her Employer on the Office letterhead to the effect that he/she is a regularly appointed Central Government Servant and not on casual/ad-hoc/daily wages/hourly paid/contract basis employee. Candidates who are willing to apply for more than a post should send the separate application form with DD for each applied post.